The Pale Hold Guard perpetually patrols the road near Loreius Farm. 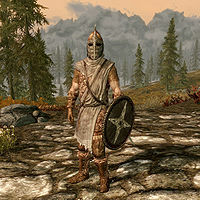 He wears a set of Pale Guard's armor, a Pale Guard's shield, a Pale Guard's helmet, fur boots, and fur gauntlets. He is equipped with a hunting bow with twelve steel arrows, a steel dagger, a leveled one-handed weapon, and a torch. If you approach him before starting the related quest, or after it has been completed, he can be found saying, "You need something?" You only have one dialogue option: "No, nothing. I'll just be moving on." The guard will reply, "Well all right, then." If you exit dialogue without selecting an option, he will say, "Move along, now." During the related quest, Vantus Loreius will task you with getting rid of the jester Cicero whose wagon has broken down in front of his farm. He will suggest that you report Cicero to the Pale Hold Guard: "Well, there is something. There's a guard, patrols the road that crazy jester is on. He passes by pretty often. You could report the fool. You know, say he's done something against the law. That will at least get rid of him for me. What do you say?" If you agree to report the jester to the guard, Vantus will happily respond: "Ha! Wonderful! Like I said, the guard is down by the road. You really can't miss him. You tell him that jester is up to no good, and he'll deal with it. Then come back here, and I'll toss a few coins your way, yeah?" "Did he now? Nobody pilfers property on my watch. My thanks for bringing this to my attention, citizen. Don't worry, I'll take care of it." "What? How dare that little fool! And right under my nose! My thanks for bringing this to my attention, citizen. Don't worry, I'll take care of it." "What? An assault. On my watch. By the gods, he'll not get away with this. My thanks for bringing this to my attention, citizen. Don't worry, I'll take care of it." "You look like a crazy man to me. And what's in that coffin, hmm?" Pale Hold Guard: "You there! Fool! Hold fast. You've been accused of a crime against the laws of this land. What say you in your defense?" Pale Hold Guard: "You look like a crazy man to me. And what's in that coffin, hmm? Maybe some time in a cell will help loosen that lying tongue." Pale Hold Guard: "You just keep quiet and stay where you are. Soon as my relief arrives, we'll all take a nice little trip." If you return to the farm after turning Cicero in, the guard will inform you that Loreius and his wife have been killed: "You don't want to go up to that farmhouse, citizen. It's a terrible sight. The farmer and his wife, slaughtered in the night. 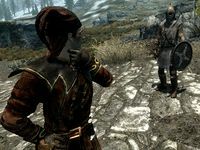 So many knife wounds..."
If the Imperial Legion captures the Pale during the civil war questline, this guard will be replaced by a Roadside Guard. He may be hostile towards you if you've joined the Imperials during the Civil War questline. ? This page was last modified on 13 June 2017, at 06:18.